Learning to take risks and venture out of my comfort zone when creating art is one of the many things I have learned during this class. Within these five weeks, I have also learned many things about myself. I have always loved the arts, but this class showed me that I could possibly have a future as a designer. I'm not going to lie, when I chose this as my summer school class, it was just to get the credit out of the way. However, reflecting back on these last weeks, I have realized that the knowledge, friendships, and love of art I have gained is something I couldn't have achieved in any other class. I have learned to challenge myself, and that an art piece can always improve." good idea to try different stuff to see what you want to do in life ." I really loved being a part of your class. I came in with the goal of moving to Advanced, and eventually AP Studio. I knew I was going to learn about techniques and all, but I got way more out if this class than just that. From the loud music, organized chaos, potlucks, and being able to see how other people view art, this has been one of the best classes I've ever had. I can't wait to continue this sort of thing for my junior year." This art class was very nice and I enjoyed it. What I liked was how we had the freedom to work on our art projects with no interruptions. There was always music playing and it was very productive. I had a very good experience in the class and I would recommend it to everyone." Now my eyes have opened up to a new world of art. Mr. Black told me I should take another art class because I really understood the watercolor concept. And that’s when I decided I should do my final project in watercolor. Also, at that moment I decided that I would want to do watercolor art as a part time job and a hobby. I really enjoyed creating this piece because it opened my eyes to what technology could help us with in creating new things. How does it help? By putting more that one idea together to create your own artwork. I would like to thank Mt. SAC and Mr. Black for opening my eyes to a whole new art world." My experience in this summer school class was great, thanks to Mr. Black. I have become a way better artist and have a much better understanding and appreciation for art and artists. I feel that I would want a career that relies heavily on art, and that is to be a shoe designer for Nike because I feel that I have some very cool ideas for some shoes. I feel like that career would be very fun and interesting as well because I love shoes and making shoes for people would be so much fun! I think me being a shoe designer, could change the game of art because if I could make it there, then anyone can because i’m not a very good artist. Overall, this was a great class and I definitely enjoyed my time in it!" In this art class, you can learn so much about different people, which has led to some friendships in this class. I enjoyed the environment. The music playing all the time and the happiness and energy you can feel really helped create my favorite artwork. I enjoyed being able to see what other students created and how everyone's work all has the same root, but different stories in each and every piece." In Mr. Black’s art class I learned many new things. I never thought of making a drawing only using dots, or recreating masterpieces. I got to do all of that in this class because of Mr. Black. Summer school this year was amazing with all my friends and an awesome teacher. I hope I’ll be able to take advanced art sometime in the future and learn even more things from Mr. Black." Before entering art class, I was very unsure of how it would go. I thought that I would be stuck in a class with a lot of Picassos and I would be left out and always playing catch up with them. I didn’t know I would love it and look forward to it every morning. Although I was a little scared before waking into D10 for the first time, the biggest blessing in disguise was my teacher, Mr. Black. Who knew that a small individual can have such a big and compassionate heart. It doesn’t matter if he doesn’t have much hair on the top of his head because he does have all of my respect and a little more than that. It’s like he never mentally ages, he’s still got the charm of someone my age. Even though he does look tired and grumpy, he defines “never judge a book by its cover.” He never treated me like some little kid and never treated me like anybody lower than himself, especially not because of my artistic limitations. I was fortunate enough to have him, and I’m humbled by it because he truly is an angel that does the little things to make your day, like putting a candle with your hero in front of you, or playing the music you're into and talking to you about it. Some people making small impacts in your life, but Mr. Black made a crater in me, as a person. He taught me how to become a better artist, but more importantly, he showed me how to be open, not judge, to tolerate even the toughest and most difficult people. Mr. Black is a great example of a person, his upcoming students are lucky and blessed to have him. No, I’m not kissing up to him, if anything I don’t think my words have given him justice, but I thank God for his strangeways and meeting him." The best thing about art this year was the creativity. Being able to make what you want with minimal direction is something I love about art. The freedom and possibilities of art is the most important factor to me. This class not only taught me how to correctly do art but also how to express myself more creatively. Because of this class I believe I will no longer hate doing diagrams of other visual projects because I will now know how to do them creatively and accurately. 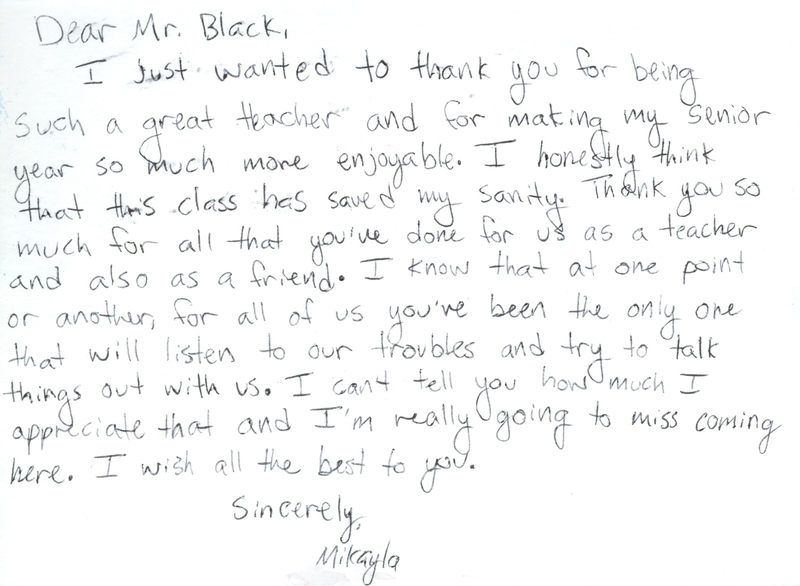 Thank you, Mr. Black for helping me improve my skills and increase my confidence." I appreciate the time you dedicated to me and my classmates when I was in high school. In hind-sight, I took it for granted. Thank you for cultivating my artistic nature and overseeing a kind/creative classroom. You are 1 in a 1,000,000 sir. I love you a million times over ❤️." I was just browsing your Artsonia website and came across my profile...there it is! My whole portfolio from high school. Instantly I remembered each and every piece up there. Thank you for all of the great memories, for inspiring me to express myself artistically, and for most importantly...being you. You made high school fun, exciting, and somewhere I looked forward to going. You truly are an amazing educator and have left an impact on my life. Thanks a million! I hope to catch up sometime in the near future..."
Aloha, Mr. Black ❤️ I just wanted to let you know that you are wonderful and appreciated and that you made art my favorite class to this day. You gave me the freedom to explore and learn and I love you for that. I hope you’re doing well and I hope to connect in the future and catch up." My Son Tyler enjoys your class. Thank you for putting your time into our children and for always encouraging them to do their best!" I am so thankful for all you have done for my student, Emily. Before your class she would never color and she disliked everything to do with coloring, drawing, and painting. But thanks to your wonderful teaching, she now colors and paints at home, so thank you for your time with each student. She enjoys your class and she doesn't like to interact with teachers, but you she will, so thank you." Thank you very much for your dedication to teaching my son to see that he can be artistic. I can see his progress and I'm enjoying seeing his projects. Keep up the good work. Thank you." Dear Mr. Black, I'm so thankful to you for all that you do for my son Jeremy. He loves your class. I'm so proud of the work he has done and how you bring out his creativity. I'm excited to go to the [art show] this Sunday. Thank you again and please continue to be the best teacher. 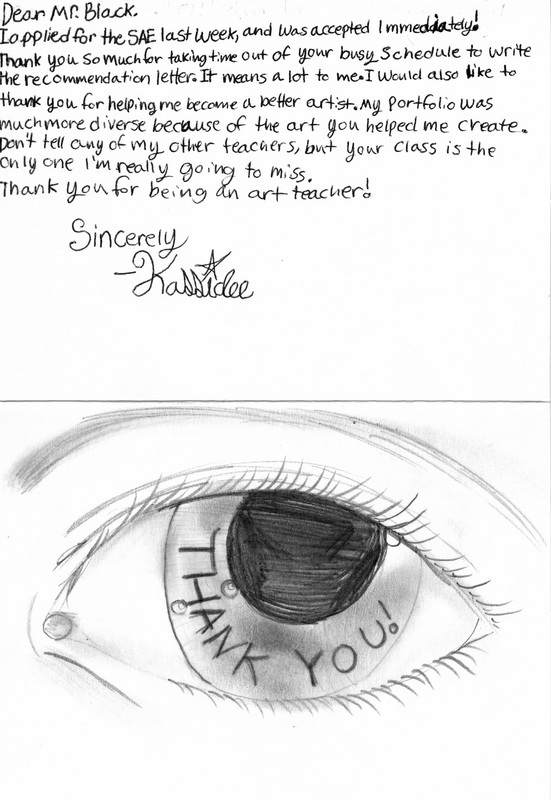 Sincerely, Brenda"
Thank you for all your hard work you put into the art classes at San Dimas High School. I know my son, Ezekiel is really enjoying having you as a teacher and appreciates your guidance." I want to thank you so very much for all that you do, thank you for giving your time to the Reed program and making Ceejay feel as though she was a special student. You have been a mentor to my daughter; you have helped her become confident in her abilities and you’ve inspired her to follow her passion and most importantly you have encouraged her to dream big." Thank you for inspiring the kids to use their talents, and taking the time to post the drawings online. Instead of being on their phones all the time, they get to use their hands to draw. Thank you." Thank you for being an amazing teacher to both my son Tommy and Kayli!" ​Thank you for all you do for our kids! Isaac really enjoys your class and I love being able to see his art online!" Dear Mr. Black, Thank you for all the support and motivation you give your students! My daughter enjoys your class and has gained better self-confidence in her artwork and her ability to enhance her skills. Tatiana also stated she likes that you enjoy their classic rock and pop music!! =) Thank You for all you do!!" Thanks Mr. Black for using Artsonia for your students. Some of my family members have viewed Shiloh's work and have bought some items. We also have bought a couple of items. Looking forward to seeing more." Mr. Black you are an awesome teacher! Thank you for all the work you put into the nurturing and developing skills in the talent of all our kids. You have awakened a passion in my son that I hadn't seen in a long time. You tore him away from his video games and through [art] have breathed new life into my young man at such a trivial moment in his life. He speaks so highly of you and I cannot begin to thank you enough!! :) Keep up the good work. Sincerely, Gretchan"
Great projects!!! Your teaching has produced some really great artists! Love stumbling upon great artists and the teachers behind them. I am a 6th - 12th grade art teacher at a private Christian school." Hey good job Mr. Black! I like how you just let your students express themselves! - Ernest"
Hello Mr. Black, I am Adam's mom, (class '08), and I just viewed the murals your students did at the SD maintenance yard...they're awesome! Congratulations. Also, you are very dedicated to your art profession on the Artsonia museum website. Jane"
I would like to thank you for having Kyle in your class. I know he enjoys art and I wish he could have shown more of his hidden talent. Great job Mr. Black :-)"
You have a wonderful art department! I was wondering if you could help me! I am trying to get an AP Art Class going at my High school. I would love to hear about some of your projects. Thanks, Amy"
You are one of the best and SDHS is blessed to have you as a teacher. Keep challenging and teaching the SAINTS." Wow! Great teacher and quite a looker!!" Artists are truly "gifted" people with special talents. You have truly inspired my son Adam in finding joy in doing his artwork(s). His dot value art project is AWESOME. We are blessed to have you as his art teacher! Sincerely, Jane"
Mister Black you freaking rock my socks!!" This teacher is awesome. --Nam"
WOW!!!! Keep up the good work." I'm so glad to see that students are still benefiting from the skills of the best teacher I've ever known. Looks like you have a truly talented group of kids. Always wishing you the best in everything you do." I am very grateful Amy has a teacher that helps her as much as you do. You are to be commended for helping young artists this way."